“Ninety percent (90%) of the cases attended to by the social workers at the Muslim Judicial Council (MJC) Social Development department are related to abuse.” So says Shaykh Fadihl Emandien, who heads the unit. 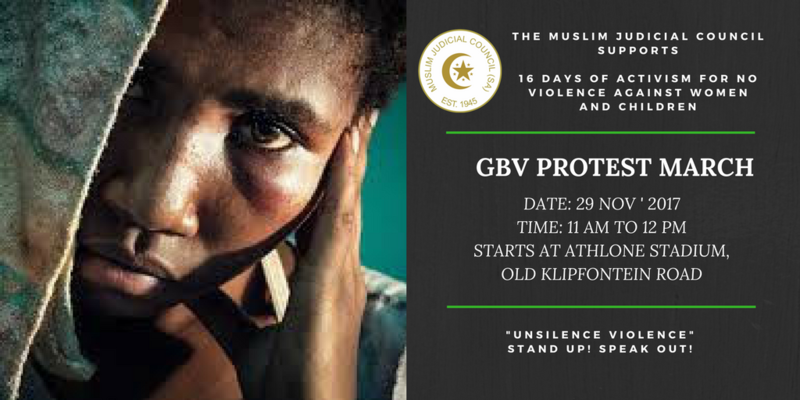 His comments come ahead of an interfaith silent march in Athlone on Wednesday, 29 November 2017, which the ulama body is hosting in partnership with various civil society organisations to mark the 16 Days of Activism against Gender-Based Violence. According to the chairperson of the MJC Women’s Forum, Khadija Patel-Allie, violence against women and children may be an international phenomenon but in the Western Cape, it has reached pandemic proportions. “A recent report by the Medical Research Council found that 40% of men assault their partners daily. The report also stated that three women in South Africa, are killed every day by their intimate partners,” Allie explained. “Gender-Based Violence is a silent, insidious serpent that is cutting through all barriers of society. It does not discriminate and affects the young and old, the rich and poor, no matter of race, social status, political affiliation or religion,” she added. The MJC calls on members of the community and civil society to join the silent protect action and to stand up against GBV. The march will kick off at 11h00am at the Athlone Stadium and will proceed down the Klipfontein Road corridor towards Jakes Gerwel Drive [old Vanguard Drive]. The procession will then turn around and head back to the stadium where a short programme will follow.